endurance, empowerment AND OVERCOMING THE GENDER SPLIT. Running should be enjoyable, social and empowering for whoever chooses to do it. Runners can be encouraging and inspirational beasts, although some of them can be terrifying, aloof characatures of themselves. Running for the masses should not be about times or podium places or splits or diet. That’s for the elite athletes. Most of us are not, and will never be elite athletes. Running should be about achieving something for yourself, having a brilliant time, getting a nice medal and having a beer/coffee/decaf soya cappuccino afterwards. Everyone started somewhere. Everyone. And with the right attitude those people will never finish, they will keep on going and achieving. To me, Ultra Running is the new Rock and Roll. And having worked in the music industry for almost 12 years, I know ALL about that. 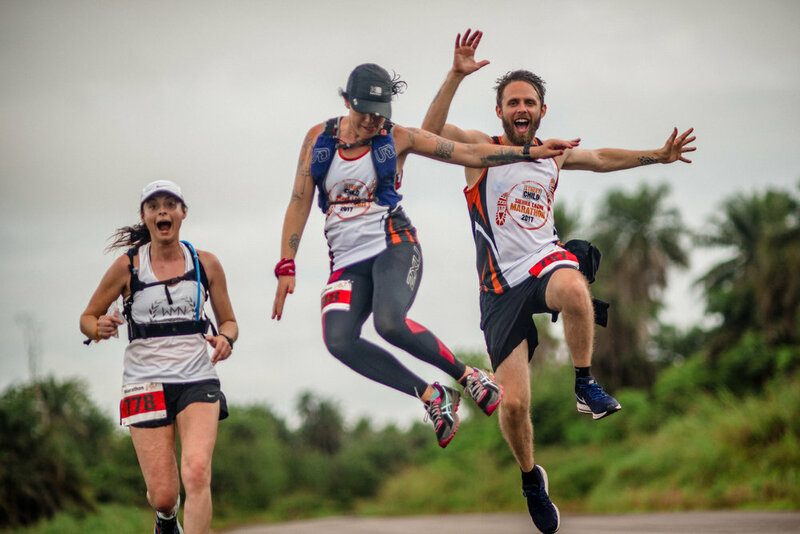 My experiences of covering huge distances and running in extreme conditions have led me to become a more confident, happy, patient forward thinking person in all aspects of my life from work to relationships. Running is also supposed to be fun. A lot of race companies are not. If you have a leg or two you can probably run a bit, but a lot of race companies don’t want you know that. They want you to think their races are BRUTAL SURVIVOR AWESOME SUFFERFEST FROM HELL FOR THE FITTEST races, that you have to train for 3 years to do. Most of them are not, and are pretty achievable with the right mindset and, of course, a bit of training. If race companies were a little more encouraging, inclusive and thoughtful with their marketing, maybe, just maybe, more people (women especially) would do them. There are of course exceptions to the rule. There are some glorious race companies out there, many of whom I am lucky enough to have run with and work with (see my Partners section for more on that). Through running with them, I have met people that have changed my life, made me a better person, helped me cope with depression and anxiety and encouraged me to be hella confident when it comes to putting one foot in front of the other both in my work life and in my recovery from depression. I’m basically on a mission to make running, which is the most glorious thing in the world, a little more inclusive. When I first started, I was pretty scared of runners, because they were all serious and looked at me weird (I was wearing a full tracksuit to do the Staines 10K to be fair) and this went on for quite a few years. At the start line of my first marathon, I was more worried that people were laughing at my Karrimor armband/how fast I could set out than if I would actually finish the race. I spent a lot of time during that race wondering if I was “doing it right”. A lot of the races I have run have been so incredibly male heavy, that I have gone off at a pace way too fast for me because I am surrounded by men. Granted, it’s how I got my PB (I was running with three quarters of Berlin’s male runners at 7.30 minute miles because I thought it was normal), but it’s also not right. Women are the winners when it comes to endurance. We are the ones that have the children, and then have them again and again. We are superhuman machines. So why are we an afterthought for race organisers? Why is it that when we ARE targeted by ads, they need to include the word “pretty” and make everything pink and 5-10K in Battersea Park? My mission here is simple. I want to show all women (and men) that it is possible to do anything. With training, with mental strategy and with patience and enjoyment, you can achieve anything. You can be extraordinary ordinary. For more information, to talk to me about your race company or to book me in to talk you your business about empowerment through endurance sport, hit that contact button up the top.